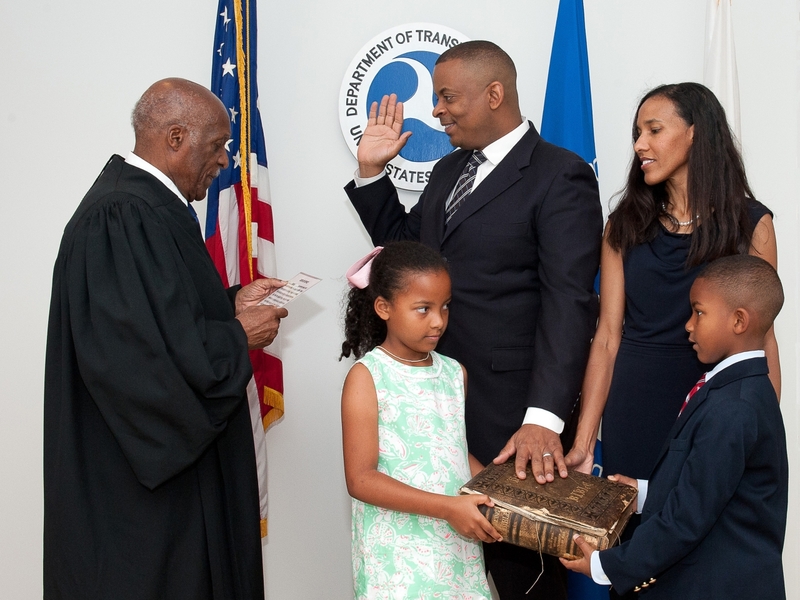 Charlotte Mayor Anthony Foxx was sworn in as the nation’s 17th Secretary of Transportation by Judge Nathaniel Jones in a private ceremony at U.S. Department of Transportation headquarters at 11 a.m. today. The ceremony was attended by Foxx’s wife, Samara, and their two children, Hillary and Zachary, and used a Bible belonging to Secretary Foxx’s great-grandparents, Peter and Ida Kelly. Secretary Foxx worked for Judge Jones as a law clerk for the U.S. Sixth Circuit Court of Appeals after law school and invited Judge Jones to administer the oath of office today. Secretary Foxx is spending his first full day meeting employees and holding meetings on important issues facing the Department, including transportation safety and hurricane and severe weather preparedness. Foxx was confirmed by the full U.S. Senate in a unanimous vote of 100-0 on June 27. As Secretary of Transportation, Foxx leads an agency with more than 55,000 employees and a $70 billion budget that oversees air, maritime, and surface transportation. Prior to his confirmation, Foxx served as the mayor of Charlotte, North Carolina, from 2009 to 2013. During that time, he made efficient and innovative transportation investments the centerpiece of Charlotte’s job creation and economic recovery efforts. These investments included extending the LYNX light rail system, expanding Charlotte-Douglas International Airport, and starting the Charlotte Streetcar project. Prior to being elected mayor, Foxx served two terms on the Charlotte City Council as an At-Large Representative, where he chaired the Transportation Committee. Secretary Foxx is an attorney and has spent much of his time in private practice. In addition to his work as a law clerk, he served as a trial attorney for the Civil Rights Division of the U.S. Department of Justice and as staff counsel to the U.S. House of Representatives Committee on the Judiciary. Foxx received a law degree from New York University’s School of Law as a Root-Tilden Scholar, the University’s prestigious public service scholarship. He also earned a bachelor’s degree in History from Davidson College. You can see our previous coverage of Anthony Foxx’s Senate confirmation and the hearing that preceded it, his track record, and his thoughts on active transportation.